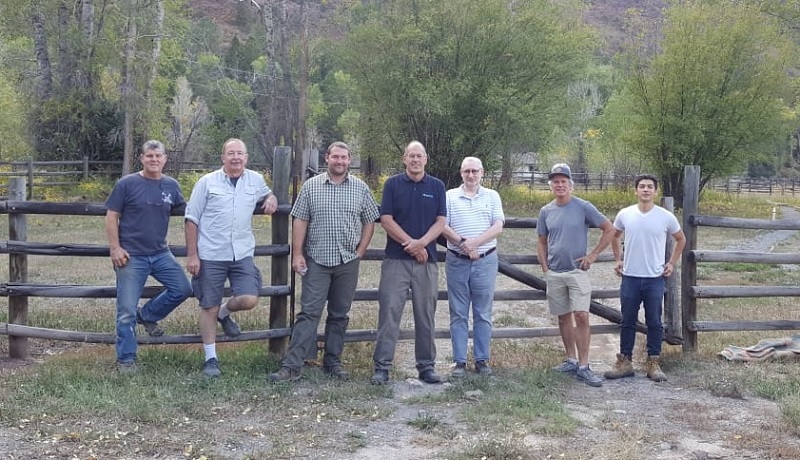 In September 2018, Jaime from our team had the opportunity to visit the Alpine Workshop in Ouray, Colorado and participate in one of the workshop sessions. We asked him to tell us about his experience at the shop to give anyone considering coming an insider's perspective on what happens during the workshop! If you have questions about Alpine, feel free to get in touch with the team via email or phone at 888-925-7999. Alpine was a unique experience all around. Now that I've had time to reflect on my experience at the workshop, I thought I'd write a little about my time there so anyone thinking about going has a better idea of what they can expect. I have a pretty good background in woodworking, but building windows and doors was brand-new to me, and I was eager to soak up as much knowledge as possible during my stay in Ouray. It was my first-time visiting Colorado, and little did I expect we were headed to an old mining town hidden in a mountain valley. The topography and the rugged, rocky vistas constantly remind you that you are in the “old west” part of the country- it's easy to imagine what this place was like 150 years ago, when this was still a frontier. The setting is a small town with one main commercial street, with about 1000 inhabitants. The town is surrounded by beautiful ruckus mountains creating a fascinating ever-changing environment. Every passing hour of the day revealed different shades and textures on the walls of rock that guard the town. The town is filled with a laid-back, friendly attitude and feeling, that someone coming from a big city may even be a little shocked at first. We covered the entire process, starting from planning the wood and laminating our door cores all the way to the finishing. Every day we dug a little deeper on the process as the builds progressed. For this build, we used the Rangate Flex Set, which I had read up on many times but never got a chance to see in person. Before we got running shapers, we would spend time looking at the tool drawings, understanding what part of the door we were about to mill, and understanding the purpose of each tool element on the overall scope of the door. We also looked at the right way to stack tool elements, and the safety measures to check prior to running the machine to avoid tool damage and safety hazards. We looked at different fence set ups, different piece hold down methods for the shaper, both in the profiling and tenon applications with safety as the first concern. We also looked at how to correct snipe. We learned the right way to measure tenons, and how to size them correctly for the clamping process as well as the storm proofing that follows. We also experimented with different kinds of joinery, using tenons, coped joints for dowels, and dominoes and used both the Shapers as well as the Soukup tenoning machine to cut our pieces. After two days of constantly changing tools to achieve a finished profile, I realized the true speed and precision advantages of a dedicated window machine. The ability to automate the profile changes onto a single spindle was a massive time-saver. We went into depth understanding the space clearances required within a window/door, and how critical these are for a perfect seal both at the meeting rail and meeting the frame. It was great being surrounded by other woodworkers, each sharing little tips and tricks of their own, and offering their perspectives and how they would go around something. What really stood out to me is that each statement from Joe was followed by a “let me show you”- he would then pull out a sample and explaining why certain things work well, or certain things that he’s tried that don’t. From these conversions I learned a couple interesting tips of the trade such as: when panel profiling, run the end grain first, or when storm proofing, run the top and bottom rails first and then the side rails, as per to clean up in the second operation any defects that could have occurred machining against the grain. One tip I learned from Mike, a fellow Alpiner, is that when checking a board for “which side looks better” 95% of the time, the “inside” side of the tree will be the better looking one. Several window and door samples can be found in the shop, allowing hands on visual conversations about how things come together in different ways. Hardware was a recurring theme. Every day we spent at least an hour talking about different hinge choices, locking mechanism, or functions. Getting a better understanding of the non-wood processing side of window building was one of the most valuable things from the workshop for me. That includes gasketing, glazing, and hardware, all which were all outside of my comfort zone, until now. We learned about the differences between dry and wet glazing, and the different implications that come with each. We spent some time looking at Lift and Slide bottom and top rail hardware solutions, exploring the different machining requirements and consequences of their choice on the look and thermal performance of the finished product. We spent some time looking at different gaskets and how to properly install them, and how to cut or lap them at corners and joints. We looked at different hardware brands and styles and built a shortlist of “winner” combinations following the discussion, so I can go home and order the right hardware to build a lift and slide that looks beautifully clean and has great thermal breaks. One eye opening thing was to realize how deep the art and science of building great windows and doors goes. The shaper is just one of the areas where I felt like I was building skills and experience. Getting to understand the entire process, and the different machines and tools we used at each step, really helped me fill the gaps in my understanding. Dinner time was always great permanently talking about woodworking; our shops, funny stories from employees, struggles with power providers, etc. Occasionally, we talked about other things, and having two firefighters amongst the crew was a guarantee for thrilling stories every time. We also did a couple morning hikes to get the day started with fresh mountain air. One early morning we visited Box Canyon before the sun had risen. Being below the canyon while still dark and the stars gently fading away was a spectacular and surreal setting to be in. Overall, Alpine was an exceptional learning experience, and I look forward to my return to Ouray and getting more hands on knowledge on joinery and window and door building.